ಹೊಸ ಮಗು ಮತ್ತು ಬಾಣಂತನ ನಮ್ಮಲ್ಲಿನ್ನೂ ಆತಂಕ ಕಾತರ ಹುಟ್ಟಿಸುವ ಸಂದರ್ಭಗಳೇ ಹೆಚ್ಚು. ಇಂತಹ ಬಾಣಂತನದ ಸುತ್ತಮುತ್ತ ಇರುವ ಕೆಲವಾರು ನಂಬಿಕೆಗಳನ್ನು ದಾಖಲಿಸುವ ಪ್ರಯತ್ನ ಇದು. ನಿಮಗೆ ತಿಳಿದಿರುವ ಇನ್ನಷ್ಟು ಆಚರಣೆಗಳನ್ನು ಇಲ್ಲಿ ಸೇರಿಸಿದರೆ ಸಂತೋಷ. (೦೧) ಮಗುವನ್ನು ಬೆಳಗಿನ ಎಳೆ ಬಿಸಿಲಿಗೆ ಹಿಡಿದರೆ ಮಗುವಿಗೆ ಒಳ್ಳೇ ಬಣ್ಣ ಬರುತ್ತದೆ (ಪಿ.ಎಸ್.ಪಿ.ಯ ಖಜಾನೆಯಿಂದ). (೦೨) ಬಾಣಂತಿ ನೀರನ್ನೇ ಕುಡಿಯಬಾರದು (ಥಂಡಿಯಾಗುತ್ತದೆ ಅನ್ನುವುದು ಕಾರಣ). (೦೩) ಬಾಣಂತಿಯ ಹಾಸಿಗೆಯ ಬದಿಯಲ್ಲಿ/ ದಿಂಬಿನ ಅಡಿಯಲ್ಲಿ ಪೊರಕೆ ಕಡ್ಡಿ ಇಟ್ಟರೆ ದುಷ್ಟಶಕ್ತಿಗಳಿಂದ ರಕ್ಷೆ. (೦೪) ಮಗುವಿಗೆ ವಿಕಾರವಾಗಿ (ಚಂದವಾಗಿ ಉರುಟಾಗಿ ಅಲ್ಲ) ಕಾಡಿಗೆ ಬೊಟ್ಟು ಇಟ್ಟರೆ ಮಗುವಿಗೆ ದೃಷ್ಟಿ ಆಗುವುದಿಲ್ಲ. (೦೫) ಮಗುವನ್ನು ತಾಯಿಯೇ ಒಂದೇ ಸಮನೆ ದಿಟ್ಟಿಸಿ ನೋಡಿದರೂ ಮಗುವಿಗೆ ದೃಷ್ಟಿಯಾಗುತ್ತದೆ (ಕಾಡಿಗೆ ಬೊಟ್ಟಿನ ವಿಕಾರ ಇಲ್ಲಿ ಕೆಲಸ ಮಾಡದು). (೦೬) ಹಸಿ ಬಾಣಂತಿ (ತಿಂಗಳಾಗುವವರೆಗೆ) ನೆಲದಲ್ಲಿ ಕೂತುಕೊಳ್ಳುವಾಗ ಸುಖಾಸನದಲ್ಲಿ (ಚಕ್ಕಂಬಟ್ಲು ಹಾಕಿ) ಕೂರಬಾರದು. (೦೭) ಬಾಣಂತಿ ಓದಬಾರದು, ಬರೆಯಬಾರದು, ಹೊಲಿಯಬಾರದು, ಯಾವುದೇ ಕಸೂತಿ ಕೆಲಸ ಮಾಡಬಾರದು (ಕಣ್ಣಿಗೆ ತೊಂದರೆಯಾಗುತ್ತದೆ ಅನ್ನುವುದು ಕೊಡುವ ಕಾರಣ). (೦೮) ಹೆರಿಗೆಯಾಗಿ ಎರಡು ಮೂರು ವಾರಗಳ ವರೆಗೆ ಬಾಣಂತಿ ನಡೆದಾಡಲೇಬಾರದು (ಅವಶ್ಯಕ ಕೆಲಸಗಳಿಗೆ ಹೊರತಾಗಿ). (೦೯) ಇದೇ ಸಮಯದಲ್ಲಿ ಮಗುವಿಗೆ ಹಾಲೂಡಿಸುವ ಸಮಯವಲ್ಲದೆ ಆಕೆ ಕೂತಿರಬಾರದು, ಮಲಗಿರಲೇಬೇಕು (ಬೆನ್ನು ನೋವು ಬರುತ್ತದೆ ಅನ್ನುವುದು ಕಾರಣ). (೧೦) ಬಾಣಂತಿ ಕೋಣೆಯಲ್ಲಿ ಹೆಚ್ಚು ಬೆಳಕಿರಬಾರದು, ಅರೆಗತ್ತಲೆಯೇ ಇರಬೇಕು (ವಿಶ್ರಾಂತಿಗೆ ಅನುಕೂಲ ಅನ್ನುವುದು ಕಾರಣ). 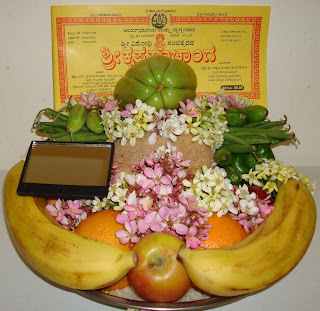 ಓದುಗರಿಗೆಲ್ಲ ಸೌರಮಾನ 'ವಿಷು' ಯುಗಾದಿಯ ಶುಭಾಶಯಗಳು. One who is PHYSICALLY FIT should be feeling well. One who is FEELING WELL should be physically fit. Which one of the above statements is true? Both can be true or none. Because fit and well are relative terms. They could be ambiguous at times. So what is Fitness, and what is Wellness? Claim:: Fit/Fitness & Well/Wellness -are NOT interchangeable terms. Reason:: Because, fitness is physical attribution, it is quantitative; and wellness is mental attribution, it is qualitative. Warrant:: Physically Fit person is not always at the optimum health & a perfectly healthy person may not be (technically speaking) physically fit. She's very fit because she does a lot of ballet dancing. People often find that if they keep/stay fit, they sleep better. (British slang) If you describe someone as fit, you mean that they are sexually attractive. INFORMAL She said she was (as) fit as a fiddle (=in very good health). fitness noun [U] Physical fitness is encouraged for children in most schools. well (HEALTHY) adjective [usually after v] healthy; not ill. He hasn't been too well lately. When she came home from school she didn't look at all well. I'm sorry you're ill - I hope you get well soon. They sent a get well card. The health center has set up a well woman/man clinic (=a place where particular features of health important to women/men can be tested). Fitness: Physically and Mentally sound. Wellness: Good health, esp. as an actively sought goal. B : Stipulations: Wellness, in my point of view, is well rounded term. It is not just focusing on physical health, but includes our mental, emotional, spiritual, and social aspects of well-being too. Similarly, Fitness is also more complete when we refer to others’ adaptability to the life, their appropriateness, current-ness, and their well adjusted presence in the society. Wellness is how we feel and evaluate ourselves, whereas fitness is how we evaluate others. Wellness is internalized, Fitness is externalized. C : Negations: Fitness doesn’t include your health conditions. It is not your Diet practice. It is not about your social circle. It never takes your feelings into consideration. Wellness, on the other hand, doesn’t focus on how far you can run/jog in a given time. It is not how well you fit into a sports team. It is not even about your high result of an endurance test. D : Examples: Wellness is specifically health term. We send well-wishing cards to our sick friend. We feel down and say, “I don’t feel well”. “I didn’t come to school on Tuesday, because I wasn’t feeling well”. Fitness, is very limited to physical qualities, at times quantities too. Either you fit into a dress or not, there is nothing in between. You are capable of going through certain endurance test to be qualified as fit in that particular category. You are in or not. It is black-and-white. No gray matter. E : Extended Definitions: That’s why fitness is physical, quantitative. They can measure your physical fitness, but none can measure anybody’s feeling of wellness. To feel well you don’t need quantity, but surely some quality of life. A person weighing 300 lbs, might be in good health condition, without any diseases. Though that person will not be called “Physically Fit”, he or she might be feeling perfectly fine inside. Their social circle might be just fine for them. They may feel Well. That is more important for happy living. An Athlete, a well acclaimed sports person may be feeling miserable due to his or her lack of social life. They may be in perfect health, dreamed body cuts, well desired figure. But if they don’t feel good in life, what is the point? 4: Fit & Well: 4th Ed. : Fahey, Insel, Roth. Mayfield Publishing Company, 2001. 5: Nutrition Now: 3rd Ed. Brown, Judith. Wadsworth, Thomson Learning, 2002.